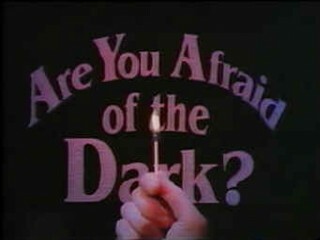 Remember the cheesy 90s show “Are You Afraid of the Dark”? Me neither. But for whatever reason I can totally hear the voice in my head that introduced the show. 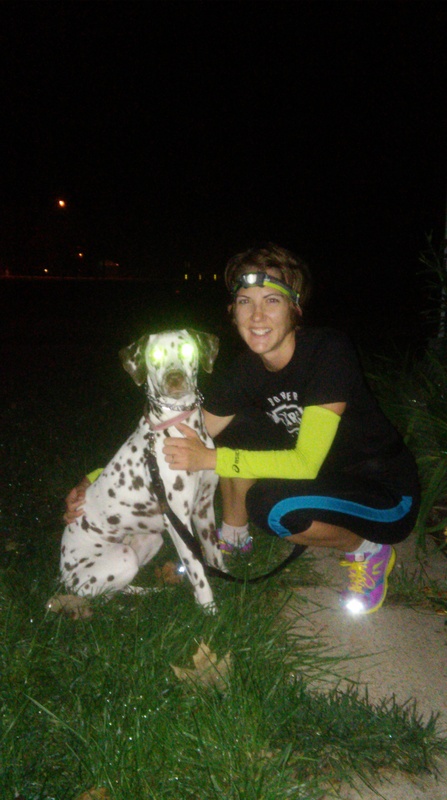 About two years ago I purchased a headlamp, intending to run more in the mornings and evenings even as the hours of daylight shortened and the weather got colder. After two years I have probably used said headlamp 4 times. This fall I am determined to do better. 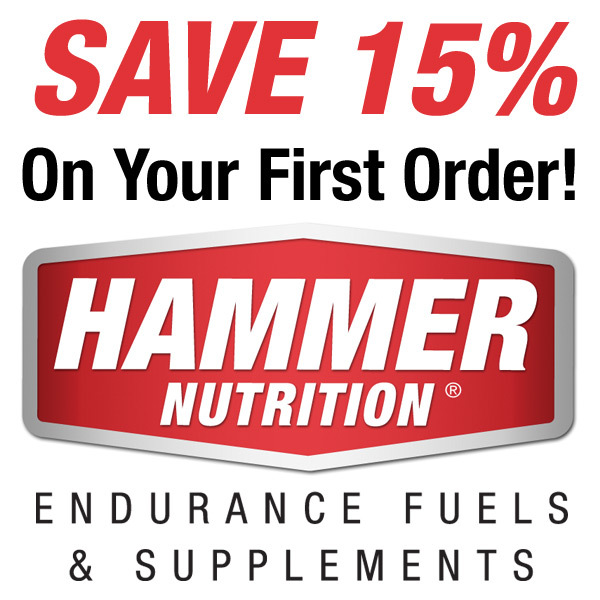 I want to increase my fitness through the winter to have a great lineup of races in 2015. My final race of 2014 is my first marathon in 5 years, the Rocket City Marathon in Huntsville, AL. To keep up on my training during the week, some of my workouts will have to be done when it is dark outside, either morning or evening. 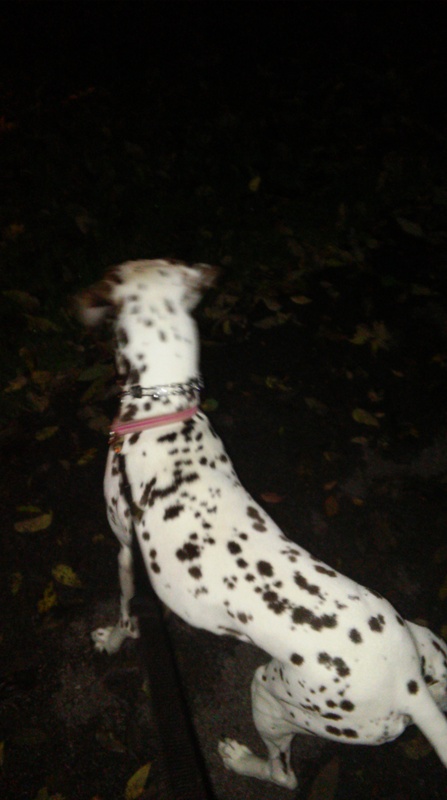 This week I set out on my second dark run of the year, taking my dalmatian Elsa with me for the first time on a dark run. We set out on a 3 mile route on a local trail one morning before I had to go to work. Once you are about .25 miles into the trail, it becomes really dark as there are no street lights, houses or buildings anywhere nearby. The first half mile or so was the worst. My biggest fear is some other animal being on the trail and deciding to attack me (unlikely, I know….sort of…..). After the first half mile, Elsa and I found our groove and the run became pretty enjoyable. I was enjoying the run so much that I decided we would go a bit longer and do four miles. Such a good running buddy! Just past the 1.5 mile point, Elsa suddenly started pulling forward on the trail, she was on a mission to get further ahead as fast as possible. After about a minute, I decided she could definitely see something I couldn’t and we turned around so we didn’t have to see said animal. Another 1/4 mile past where we turned around, an animal ran across the trail, just in front of the headlamp’s beam of light so I couldn’t really see what it was. I let out a “Augh!”, not a full on scream or anything, more a noise of surprise…….After a few steps my headlamp revealed that this animal was a bunny. Ooops. The rest of the run was uneventful, even enjoyable. I am determined to get over this fear of running in the dark, because I think those runs could actually become my favorite. Has anyone else run through dark mornings/evenings and felt uneasy? Would love to hear any words of wisdom!! I think you just have to remember that nothing out there is going to eat you or attack you. Try to relax and not overthink things while you’re out there. Try dimming your lamp a bit. If it’s so bright that your eyes can’t see in the darker peripherals, then you’re giving yourself tunnel vision. Also, try to scan a bit from side to side as you run so you’ll see the eyes of the animals that are hiding from you so you’re less likely to to be spooked. Running in the dark can be fun once you just relax and let go a bit. Last Wednesday I broke away from the group and left my headlamp off. It felt amazing to run in the dark. I am definitely getting better about running in the dark. Will try the headlamp modifications you suggest though!